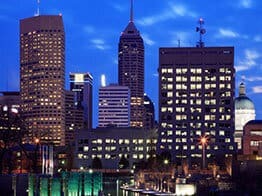 Indiana’s major cities are all linked to Indianapolis, which is widely known as the Crossroads of America. Four major interstates all run through Indianapolis, including Interstate 70, a widely-used and important part of the Interstate Highway System. I-70 passes through many major metro areas along its route, including Richmond, Indianapolis and Terre Haute within Indiana. The Indiana car shipping carriers have it lucky as the freeway system is beautifully designed. Northern areas of the state are serviced by I-69 in the east, which runs through Fort Wayne and heads all the way to Lansing, Michigan, as well as I-65, which runs northwest into Chicago and south into Louisville, Kentucky and Nashville, Tennessee. I-74 also runs through the city of Indianapolis, running from Cincinnati northwest into the city before turning west and heading into Illinois and then into Iowa, servicing the Davenport metro area. What all these interstates do for your Indiana car shipping quote is make it lower. As car transporters are able to not just get into Indianapolis from a variety of different areas, but most major cities in Indiana as well including Terre Haute, Fort Wayne, Lafayette and Gary. This allows shippers to not only get into and out of these metro areas more quickly and easily, but also allows them freedom to choose other places to go. Unlike states like Iowa and North Dakota, which only offer two or three major interstates that see hundreds of miles between major cities (and thus new customers), Indiana offers car shippers a wealth of different potential routes and many areas where customers are shipping to and from. All this culminates – usually – in lower shipping prices in and out of major areas of Indiana as well as faster pickup times because of the abundance of carriers running routes. If you are traveling to or from the Hoosier State, Direct Express Auto Transport can help you ship your vehicle. Once heavily inhabited by Native American Indians and named for them, Indiana is neighbored by the states of Illinois, Michigan, Ohio and Kentucky. As auto transport drivers head south, they may run into Indiana University in Bloomington, home of the Hoosiers and 24 Division I sports teams. They’ve been a part of the Big Ten Conference since 1999. Robert Montgomery, also known as Bobby Knight and called “The General,” was the head basketball coach from 1971 through 2000 and one of the winningest coaches in history. Larry Bird, the hick from French Lick, played basketball for Indiana State University, the Boston Celtics and the Dream Team in the Olympics. In Speedway, Indiana, you will come across the Indianapolis 500, the annual race that usually takes place around Memorial Day. During this event, various American Championship Cars are featured including the famous IZOD Indy Cars. Indianapolis was also the home to the 23rd president, Benjamin Harrison. You may be planning a trip to the Division I School, looking to relocate to Indianapolis or perhaps headed to the beach in Northwest Indiana. Either way, it’s a good chance that you need your car. Using a reliable auto transport service comes with a few benefits. You don’t have to worry about hauling your extra vehicle because shipping services will do the job for you. You may especially love using an auto transport service if you are traveling to or from another area. For more information regarding how the whole vehicle shipping process works, feel free to call our toll free number (800-600-3750). You can also talk to Indiana car shipping customer service specialist about shipping your car to Indiana. You can also visit Direct Express Auto Transport to fill out a simple form and get a free car shipping quote. We make it easy to book your vehicle shipment online.